New Discovery: A Spider That Eats Its Veggies Spiders deserve their reputation as bloodthirsty critters. Up until now, all 40,000 species known to science seemed to eat by sucking the juices out of insects and other prey. But researchers have come across a spider that eats mainly leaves. Spiders deserve their reputation as bloodthirsty critters. Up until now, all 40,000 species known to science seemed to eat by sucking the juices out of insects and other prey. But researchers have come across a spider that is a vegetarian, and is apparently the first example of a plant-eating spider. Two scientists, working independently in Costa Rica and Mexico, noticed that the neotropical jumping spider feeds on acacia leaf tips. These yummy leaf tips are primarily eaten by ants, which in turn defend the plants from predators. But the spider, known as Bagheera kiplingi, has developed a taste for the leaf tips, too. 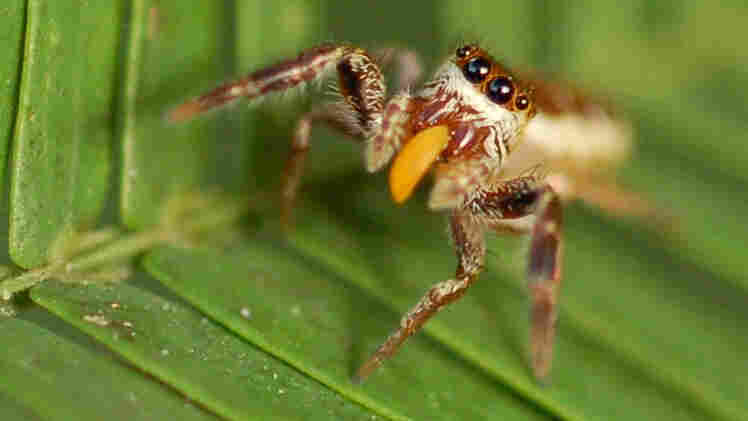 The spider does occasionally eat ant larvae, but most of its calories come from its high-fiber vegetarian diet, according to a report in the journal Current Biology.